Timothy Sexton (GotterDammerung) Progressive psychedelic acid rock. Livid Doom/Sludge trio from Minneapolis. Seedship and Highgraves are supporting. Mourning Star The Mourning Star project began in July 2014 in a small home studio in Saint Paul, when Andrew Marcoullier and Luke Ryan began to collaborate on an album that would successfully fuse modern progressive metal with hard rock. Less than one year later the Dead Yet Alive album has been released to wreak havoc on metal as we know it. Exomen Coming from southeast MN, Exomen has emerged to create a new blend of progressive metal with elements of melodic death and thrash metal. Heavy hitting riffs, gritty overtones, and thrashing solos will light the stage up creating a performance to remember and music you will never forget. Passing Sirens Passing Sirens was founded in 2012 as the brainchild of guitarist Todd Michael. Through years of trial & audition, Todd was then able to procure a line-up he was comfortable bringing into studio to realize his ideas. In early 2014, Passing Sirens recorded This Side of Heaven with Eric LaBrosse of Cherry Pit Studios WI. In early 2015, Passing Sirens' current line-up began to embody itself with the addition of vocalist RW Cartwright and bassist Jason Thompson. Colin Stetson (Bon Iver, Arcade Fire, Tom Waits) has developed a unique and highly-acclaimed voice as a performer/composer, chiefly on bass and tenor saxophones, rallying an array of technical strengths and innovations to make some of the most captivatingly organic, darkly soulful solo instrumental work of recent years with his New History Warfare trilogy. The solo violin work of Sarah Neufeld has emerged more recently, and especially through 2011-2014, in the period between her primary band Arcade Fire's last two albums. She's forged a distinctive and evocative solo violin practice combining rock, folk, ambient and modernist sensibilities, culminating with her debut solo album Hero Brother in 2013. Their most recent release together is 2015's Never were the way she was on Constellation Records. Trailer Trash got its start as a regular attraction at Lee’s Liquor Lounge, in downtown Minneapolis. With the popularity of retro-country music and swing-dancing in the mid-90s, the band found a following among new generations of music lovers. Since the bar recently changed ownership in 2015, the band has begun playing the Twin Cities circuit. Trailer Trash is known for playing traditional country music, but they can swing, rock and groove in a wide variety of styles from the American hit parade. Now in its twenty-second year, the band has turned generations of music lovers on to its brand of American roots, country, swing and rockabilly. This is a Lemmy/Motörhead tribute night and all proceeds will go to the Ronnie James Dio’s Stand Up and Shout Cancer Fund. Featuring performances from Impaler, Virgin Whores, Fret Rattles, Dawn of Valor, Trim Reaper, The Violent Shifters, and Bad Idea. Classic country & Honky Tonk Music from the Bootstrap Family Band! 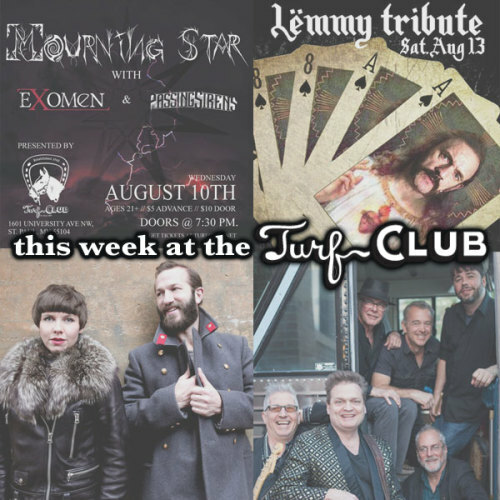 The Turf Club opens for brunch at 10:00am, and this is an all ages event with free admission.